The Complete Guide to Human Resources and the Law will help you navigate complex and potentially costly Human Resources issues. You'll know what to do (and what not to do) to avoid costly mistakes or oversights, confront HR problems - legally and effectively - and understand the rules. 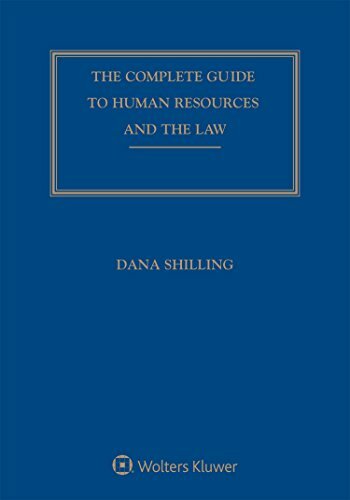 The Complete Guide to Human Resources and the Law offers fast, dependable, plain English legal guidance for HR-related situations from ADA accommodation, diversity training, and privacy issues to hiring and termination, employee benefit plans, compensation, and recordkeeping. It brings you the most up-to-date information as well as practical tips and checklists in a well-organized, easy-to-use resource. The Supreme Court held in March 2016 that to prove damages in an Fair Labor Standards Act (FLSA) donning/doffing class action, an expert witness' testimony could be admitted Tyson Foods, Inc. v. Bouaphakeo, 136 S. Ct. 1036 (2016). Executive Order 13706, signed on Labor Day 2015, takes effect in 2017. It requires federal contractors to allow employees to accrue at least one hour of paid sick leave for every 30 hours they work, and unused sick leave can be carried over from year to year. Mid-2016 DOL regulations make millions more white-collar employees eligible for overtime pay, by greatly increasing the salary threshold for the white-collar exemption. Updates on the PATH Act (Protecting Americans From Tax Hikes; Pub. L. No. 114-113. The DOL published the "fiduciary rule" in final form in April 2016, with full compliance scheduled for January 1, 2018. The rule makes it clear that brokers who are paid to offer guidance on retirement accounts and Individual Retirement Arrangements (IRAs) are fiduciaries. In early 2016, the Equal Employment Opportunity Commission (EEOC) announced it would allow charging parties to request copies of the employer's position statement in response to the charge. The Supreme Court ruled that, in constructive discharge timing requirements run from the date the employee gives notice of his or her resignation--not the effective date of the resignation. Certiorari was granted to determine if the Federal Arbitration Act (FAA) preempts consideration of severing provisions for unconscionability.